Davy Wotton's interest in fly fishing started way back in the 50s when he watched his first trout caught by a fly fisherman, to say he was hooked was a understatement. His professional career began in the early 1960s as a professional fly tier. Moved on to manage a mail order business, developing and manufacturing both fly tying and fly fishing products. One of which was the world famed SLF series of dubbings. 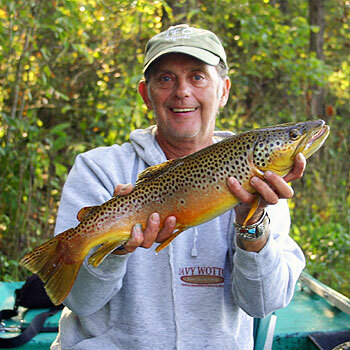 Davy Wotton is a professional guide on the White River in Arkansas and no doubt one of the top experts on the river. Learn Davy's secrets about hooking up with monster browns in this show. He began writing fly fishing articles in the early 70s and continues to do so. Many of his fly patterns are currently produced commercially for the world market. He is a consultant to many of the flyfishing organizations around the world. This past 5 years working in conjunction with Fly Fish TV he has produced a number of shows for national networks along with his own series of “How To” DVDs. "Wet Fly Ways" has had great success, with two new DVD to be released this year - "Davy's Favorite Flies" and "The White River". This past August he shot a further DVD related to stillwater fly fishing techniques in Montana. This winter here on the White "The Skills of Midge Fishing" will be filmed. Conservation is a very important issue with Davy: one that he also took further by founding the Friends of the Norfork National Fish Hatchery organization of which he is currently the President. Recently Davy attended a Friends initiative meeting with USFW personal in DC, objectively to bring about with others a National organization of recognition for Friends groups that support the USFW fisheries divisions. For which Davy is a very strong supporter. Davy was recently awarded in Atlanta the USFW Director of Fisheries award for outstanding voluntary services towards Fisheries and Conservation for services rendered. Davy is the MD of the American International Schools of Fly Fishing, and operates both fly fishing schools and a guide and outfitter service for the White river system as well as other cold water systems around the country. He is a popular speaker at fly fishing events around the country and hosts many other fly fishing activities during the year. He will tell you that there is no finer place to be than on the water fishing, and despite his professional workload he still finds time to do that. His credits for the White river amount to catching Brown trout 25lb.6oz, Cutthroat 6lb.4oz, Rainbow 8lb. 2oz., and Brook Trout 2lb 12oz. Davy is a member of many organizations that further issues of conservation and fly fishing education. FFF, TU, APGAI, STANIC, NAC, Salmon and Trout Assoc. National Instructor, FNNFH, to name a few. Competitive fly fishing has been of great interest to Davy. He has fished many times for the Welsh International Fly Fishing team, became the International coach for the American Youth team USA, He has won many awards including Gold, Silver and Bronze medals. To learn more about Davy Wotton's guide services, school, flies and DVDs visit his website, www.DavyWotton.com.